Water is so important for the correct digestion and the overall health of chickens and other poultry so really shouldn’t be over-looked. Water is THE most important nutrient in a bird’s diet. Half of a bird’s body is made up of water and eggs are made up of around 65% water. Clean, fresh drinking water is essential for good health and prevents a number of diseases from striking. The following diseases can be contracted from drinking water. Thrush – From fungus contaminated water. Algae poisoning – From toxins in the water. Botulism – From rotting organic matter in water. Gout – Lack of water. Salt poisoning – Lack of water. Numerous other diseases the bird can pick up when weakened through dehydration or when water is contaminated with droppings. 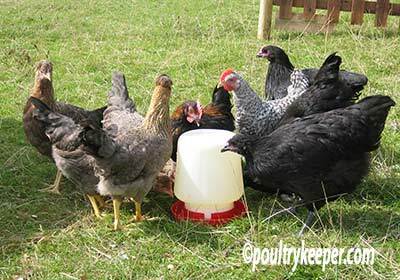 Drinking water for chickens is very easy to provide and with the right routine, you can clean drinkers before you refill them by using a small washing up brush. Water should ideally be replaced daily and containers should be kept clean. A stiff hand brush kept next to the tap can be used to scrub containers before refilling but it is a good idea to sterilise containers every couple of weeks. Green algae in containers or water is a recipe for disaster. These containers contain “Bacteria soup” and forcing birds to drink from these will lead to birds picking up some form of disease sooner or later. In winter, frozen water needs regular defrosting. In warmer temperatures, water needs to be kept cool by placing containers in the shade. Poultry use water to cool down which they cannot do if the water has heated up too much in the sun. Poultry can be sensitive to the type and quality of water provided. It is common for some birds at a show not to drink since the local water supply tastes different. If you plan to take your birds somewhere like this, always take your own water for them, just in case. If you are concerned about the quality of your supply of water, a veterinary lab can test it for you. A test kit can be bought online (in the UK for example, take a look at the Chickenvet Water sample kit). Poultry can survive for a while without food but they won’t last long without water. Chickens drink little and often. If birds simply do not like the taste of your local water supply, they will not drink enough of it (see testing above). Diarrhoea in birds causes them to lose water faster than it can be replaced. Frozen water in the winter should be regularly defrosted or placed on a heat mat / inside a house where it won’t freeze. In warm weather, the amount of water birds drink increases. Since they do not sweat, heat is expelled from the body through respiration and taking on cooler water. 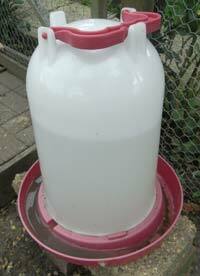 Allow at least 6 litres of water per dozen birds per day, more during hot weather. 13°C is the preferred temperature and birds will drink less at higher / lower temperatures than this. If a bird becomes dehydrated, egg production suffers and in young birds, their growth is restricted. If a hen is deprived of water for 24 hours, she may be staggering around, sitting hunched or lethargic. Fresh, clean water should be provided immediately. If she will not drink herself, dip the beak into the water. If she still will not drink, a syringe can be used to re-hydrate her orally. Make sure you squirt this down the throat into the crop and not down the trachea (wind pipe) into the air sacs. If you are in any doubt, squirt it gently into her mouth and let her swallow it. It will take her up to 3 weeks to fully recover and start laying again. She may go into a moult and egg production may not fully recover.